Having stayed at Soneva Fushi before in the Maldives (click here to read about Soneva Fushi), we knew how much we loved the eco-luxury vibe at Soneva resorts and we were so excited to ticking Soneva Kiri Thailand off our bucket-list. We stayed overnight on arrival in to Thailand close to Bangkok Airport then caught a taxi to BKK airport in the morning to head to Soneva Kiri. We were met at the kerbside of BKK airport by Soneva staff who ushered us through check in and security and straight to the tarmac to board their beautiful private plane for the scenic journey to Soneva Kiri. The plane is stunning with spacious leather seats, air conditioning, bottled water and a “help yourself” snack bar. The 1.5 hour flight to Koh Kood passed in no time as we were mesmerised by the views coming in to Soneva Kiri. The little islands below surrounded by clear turquoise and emerald water were particularly stunning from my window seat! The landing was smooth and we were met by Soneva Kiri staff and escorted on to a speedboat for the few minutes journey across the water to the main resort area. Once we were comfortably seated on the boat a staff member came around with little cotton bags that had printed “No News, No Shoes” on them. We just love this concept and happily placed our shoes in the bags and breathed out a big relaxed sigh as we immediately switched into barefoot holiday mode! 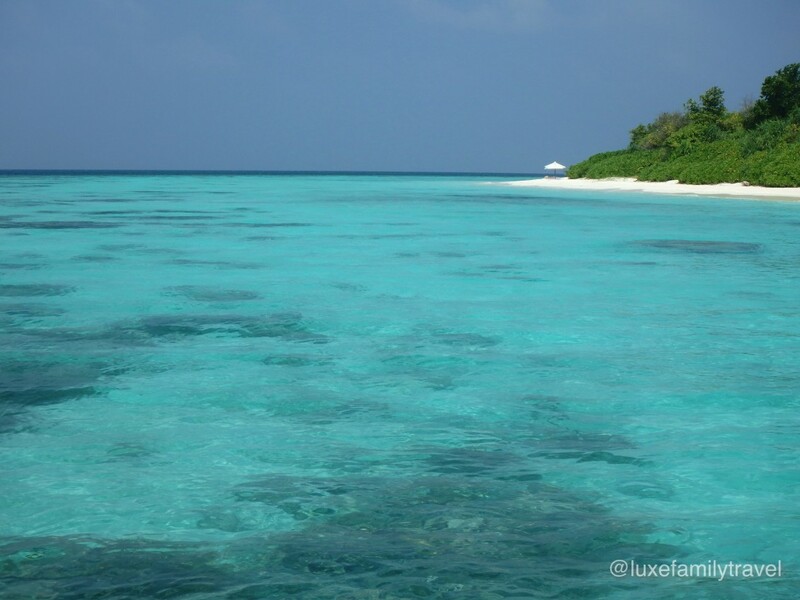 The water surrounding the resort varies from a really clear emerald-green to pale aqua and very warm and shallow. There are plenty of complimentary beach activities laid out for guest’s enjoyment, volleyball, SUP, kayaks, snorkels etc. We stayed in a 2 bedroom villa that was as big as a house! The main villa was separated from the second bedroom villa which was a great set up and suited our older children perfectly. We had our little boy sleep on a comfortable daybed (converted into an actual bed at night) in our villa with us. The open air bathroom wing was incredible! It housed two soft daybeds, an outdoor shower in amongst the foliage, an enclosed glass block shower, his and hers powder area and wardrobes and the most sublime oval free-standing bathtub I’ve ever seen! We truely felt at one with nature in complete privacy. The children loved the private pool with palm tree island in the middle and the games room on the top floor our villa. Many of the villas have their own direct beach access which is secluded and feels like your own stretch of beach. Some of the villas even have their own private water slide with gushing water to accelerate your decent into your private pool! So much fun for everyone! We drove around the island in our private golf buggy which was a lot of fun (you need to be aged 15 years and up to drive it) and it was a very easy way to get to everything fabulous eg the Cinema Paradisio – the outdoor cinema serving hot popcorn (and dinner there too if you wish which our children loved!) and the Six Senses Spa where I had a really nurturing massage followed by a steam room relaxation session. My husband used the fully equipped gym daily, located above the spa, it had beautiful views of the jungle treetops and water. The food here really needs a whole blog post of it’s own as it’s a standout feature of the resort. Guests can help themselves to complimentary gelato (soo many flavours!) all day long as well as the complimentary chocolate and dessert room stocking beautifully handcrafted treats enjoyed by the kids…both young and old! The breakfast buffet is out of this world! An incredible array of options from hot Asian bites and chicken broth noodle soup (our favourite and we indulged in a bowl or two every morning, with extra chilli!) to cereals, to every single fruit you have ever heard of, all types of healthy food options it seriously has to be seen to be believed (check out the photos attached and I could have added many more photos too as I did not/could not! upload every option). If you do nothing else, I implore you to book in for their Tree Pod dining experience. We had our most memorable breakfast ever up in the tree tops in a pod that is raised from the ground into the trees and all your breakfast is delivered by a staff member via zipline! Yes seriously!!! It was a real pinch-me moment. A MUST do. (Plus you will get excellent pictures for Instagram! 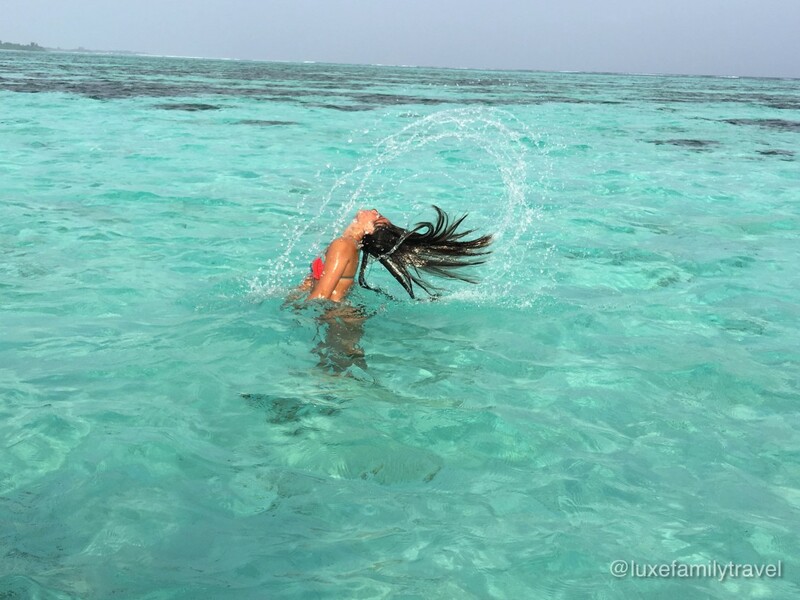 Check all ours out on @luxefamilytravel (click the link). For date night we enjoyed a really fantastic degustation meal at The View, every dish was presented like a work of art by their Japanese Chef bursting with fresh flavours evidently due to the use of organic herbs and vegetables grown on site at Soneva Kiri. I’m vegetarian and every course was spot on and delicious. This restaurant is positioned on a charming wooden deck amongst the trees and candlelight so you really feel at one with nature. Another must try restaurant is Benz which you reach via a short serene boat ride through mangroves and this gorgeous restaurant sitting on stilts with lanterns everywhere suddenly appears before you – it’s like something out of a fairytale. Benz is a Thai restaurant and absolutely authentic – try and stop at one serve of the betel leaf dish, it was so yummy I think we ordered it 3 more times! On arrival we were presented with a clear drink in a shot glass and we were invited to add into it a flower petal and lime which created something magical – I won’t ruin the surprise for you! One clear evening we stopped in at The Observatory where kind and patient staff showed us how to see the moon close up and wow it was spectacular! We travelled with our 3 children and this is an area where Soneva REALLY excel. We have been to Soneva Fushi in the Maldives too (click here to read our review) and our kids had the best experience there and we knew they would be in for the same treatment at Soneva Kiri. Nothing is too much trouble where the children are concerned, Soneva Kiri staff were always so lovely and obliging. The kids club The Den is a world leading example of what a kids club should be. No ipads/Nintendo or similar types of technology, staff who actually engage with the kids one on one, there’s so many fun and educational areas set up for the children, a music room, a reading room, a puzzle room, a NASA room, microscopes, art room (with proper art supplies not just colouring in!) slippery dip, draw-bridge…the list goes on! All set up in a massive treehouse created by clever architects, it’s really special. Soneva Kiri really encompasses everything you could want in a barefoot luxury resort, with an environmental conscience. We love the Soneva brand SO much that we are heading to their newest resort in the Maldives soon and we just know you will love all their resorts as much as we do. Follow us on Instagram @luxefamilytravel (Click the link) to follow our adventures and please leave a comment below and tell us what you think of Soneva Kiri.